One thing about war movies, is that there’s really never a bad time for them; War seems like it’s an ongoing thing, or at least it seems like it since there’s been a new one popping up since the War on Terror started in 2001. In the 11th month, World War 1 brings on the call of Remembrance for those who fought and died for the freedoms of the Western World (and parts of Europe). There are vast differences of opinions when it comes to the significance of the War, but both World Wars (1 & 2) strike up a significant amount of patriotism depending on whom you speak to. A lot of people were affected by it. In a way, we all were. What I like about war movies isn’t reflected by the action of the wars itself, but rather the characters portraying the soldier that fought in them. It’s pretty difficult to fictionalize such a climactic part of history, but even then, as we’ve seen with Inglorious Basterds, it can be done with success. 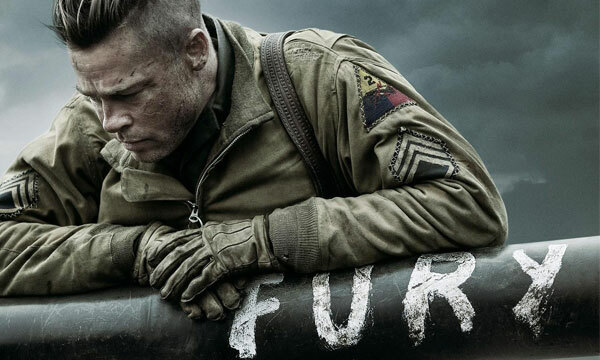 Fury walks into the line of fire that depicts the tanks and the men who worked in them to stave off Nazis in the 2nd World War – it was a different approach besides the ones taken in Apocalypse Now, Platoon, and even one of my personal favourites, Black Hawk Down. Five men cramped in a metal death machine on tracks? Much fun. Brad Pitt should just be a staple when it comes to historical movies – but then again, it’s Brad Pitt, he can do anything and that’s not debatable. He takes his most recent role as a commander of a tank unit that’s seen plenty of battle along with his staff that’s made up of Michael Peña, Shia LaBeouf, Jon Bernthal, and recently added out of random, Logan Lerman. He takes on that role of father & brother to the boys, as he commands respect, makes drastic decisions, and is an overall leader not only for his unit, but also for others. He’s what the commercials would say is “army strong.” His character was interesting to watch because of his ways of teaching young Norman (Lerman) on how to become a solider, after being thrown to the wolves with no on-the-field experience at all. Like Band of Brothers or Saving Private Ryan, the movie focused more so on the brotherhood that they formed, testing each other’s limits, while still trying to hold on to that same ideal that they’re there to win a war, at whatever cost.